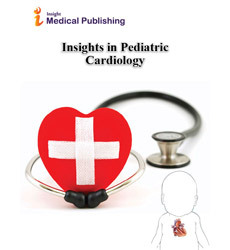 ‘Insights in Pediatric Cardiology’ is a journal that publishes articles based on original research on basic and clinical sciences related to Pediatric Cardiology. The Journal also features review articles, critiques, controversies, methods, technical notes, selected case studies s and articles of special nature. The journal offers peer-reviewed articles on Pediatric Cardiology. The journal also supports articles written based on clinical or experimental research to add value and professionalism. Its editorial mission is to focus on prevention and rectification of Pediatric Cardiology. Clinical papers emphasizing medical and surgical aspects of all aspects of heart disease in infants, children, and adolescents, including embryology and anatomy, physiology and pharmacology, biochemistry, pathology, genetics, radiology, clinical aspects, investigative cardiology, electrophysiology and echocardiography, and cardiac surgery are acceptable for publication. The Journal particularly welcomes contributions from the specialists in the field Pediatric Cardiology. An arterial disease characterized by the deposition of fatty material on their inner walls. The exact cause of atherosclerosis is unknown. However, certain traits, conditions, or habits may increase the risk of developing atherosclerosis. The common risk factors are Unhealthy blood cholesterol levels, High blood pressure, Smoking, Insulin resistance, Diabetes, Overweight or obesity, Lack of physical activity, Unhealthy diet, Older age, Family history of early heart disease etc. Congenital heart defect or congenital heart disease is an anomaly in the structure of the heart from the time of birth. The symptoms could vary depending on the specificity of the anomaly and also can be fatal. Echocardiogram, often referred to as a cardiac echo or simply an echo, is a sonogram of the heart. Echocardiography uses standard two-dimensional, three-dimensional, and Doppler ultrasound to create images of the heart. Heart transplantation in infants and children is now a globally accepted therapy. Most of the cases of heart transplantation in children are due to congenital malformations. Survival in excess of 20 years after pediatric heart transplantation has been achieved. Most programs now report that more than 70% of their recipients survive at least 5 years. A device called Pacemaker can be placed in the chest or abdomen of a child or infant to control the abnormal heart rhythms using low energy electrical pulses. It is the anesthetic practice focused on the preoperative, intra-operative and postoperative evaluation and management of pediatric patients or neonate with cardiac and intra-thoracic vascular disease. The Pediatric cardiologists face few challenging cases in their career. Those real life cases are a medium for the cardiology trainees to learn & grow. The identity of the patients is always altered or remains hidden. The cases are featured because most of them involve a diagnostic or therapeutic diemma. In 2012, 512 heart transplants were performed in children worldwide. The proportion of pediatric transplant patients by recipient age has remained relatively stable for over last decade. Many more statistical research are carried out and the facts around it make for alarming reading. The procedure of evaluating the electrical conducting system of the heart in infants, children, and adolescents is termed as Pediatric electrophysiology. Abnormalities of the electrical conducting system in children may result in arrhythmias palpitations, lightheadedness, weakness, fatigue, or syncope. Strokes can happen anytime even in children, newborns, and unborn babies. Few medical conditions can increase the chances of stroke in children such as different heart disease or a heart surgery, abnormal or inflamed blood vessels in the brain etc. Pediatric Pericarditis can be referred to as the infection involving the pericardium and leads to accumulation of pericardial effusion that, if untreated, can lead rapidly to hemodynamic collapse, tamponade, and death. The fluid is generally purulent but can be serosanguineous. Myocarditis, is an inflammatory disorder of the myocardium that is typically caused by a viral infection. Based on pathogenic findings Myocarditis can be classified as Active myocarditis, Borderline myocarditis, Nonmyocarditis. Tachycardia & Bradycardia are the two very basic forms of Arrhythmia. Tachycardia is the medical condition in which the heart rate is faster than normal. The heart rate in the upper chambers or lower chambers of the heart, or both is increases. In bradycardia the heart rate is slower than normal. The condition can be serious if the heart fails to pump enough oxygen-rich blood to the body. Long RP Tachycardia in a Toddler with Dilated Cardiomyopathy: What is the Mechanism?